If you’re ready to take the business world by storm, La Trobe University’s Associate Degree of Applied Business is the course for you. An applied business course provides you with sound practical knowledge about how organisations are structured, how the commercial world works, and how business, marketing, accounting and finance fundamentals come together in the workplace environment. Armed with this knowledge and the skills you’ve developed on the way, you’ll be ready to pursue a variety of career paths in the business world – after just two years of study. How, you might ask? La Trobe’s nested degrees offer you the option of exiting a Bachelor course early to gain a different qualification. So in this case, you’ll be enrolled in the Bachelor of Applied Business course, and after completing two years of study, you’ll be able to graduate with an Associate Degree of Applied Business. So what are you waiting for? Kickstart that business career today! 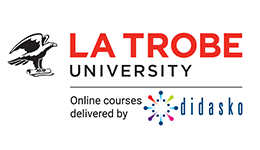 Upon successful completion of this course you will receive an Associate Degree of Applied Business from La Trobe University. Students are able to exit the Bachelor of Applied Business after successfully completing two years of study in order to obtain the Associate Degree. Graduates are then able to pursue a range of business roles with an expected income of $60K–$80K.